HeadVape variable voltage e-cig kit is built with the latest technology and the highest quality. The adjustments in voltage allows you to dial-in between 3.0V to 6.0V in increments of .1V for the right amount of vapor per hit. 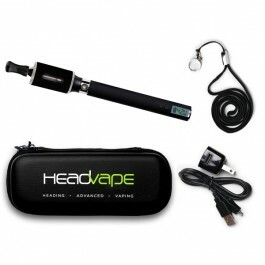 HeadVape variable voltage e-cig kit is built with the latest technology and highest quality. The adjustments in voltage allows you to dial-in between 3.0V to 6.0V in increments of .1V for the right amount of vapor per hit. Alows you to vape with almost any Tank/Clearomizer and e-juice while also extend the useful lifespan of a Tank/clearomizer.